Are WE keeping them safe? As the temperature drops, home and business owners use de-icers on sidewalks and parking lots to prevent 2-legged pedestrians from slips and falls. But our beloved 4-legged family members are at risk as they walk on the harsh chemicals or worse, indirectly ingest the salts by eating snow and licking their paws. Not good! We want to change this scenario by educating home and business owners of the potential hazards of traditional de-icing methods and provide information on safer options so they can make a choice they feel good about. ​Are you with us? We need your help to educate others! 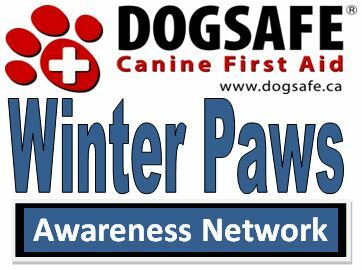 We invite you to join our Winter Paws Awareness Network ... and read, download, display and share our free resources. Thank you! Traditional ice melters are made with calcium chloride (CaCl2) or magnesium chloride (MgCl2), which are exothermic, meaning they produce heat when dissolving. How much heat depends on a few factors including percentage in the product. Good for melting ice, not good for your dog's paws, mouth or intestinal tract. They are also hygroscopic, drawing in moisture and causing dried out paws. Sodium chloride (NaCl), also known as rock salt, is not exothermic but it is drying and irritating to your dog's paws and gastrointestinal tract. Table salt, sea salt and coarse salt are also sodium chloride (with impurities removed) and may cause vomiting with as little as one to three tablespoons ingested or convulsions if larger amounts ingested. Dogs may ingest these salts as they lick and eat the crystals stuck to their fur and paws or while playing in (and eating!) the snow. Remind everyone about the importance of paw care by displaying and sharing our Mind the Paws poster. Download PDF, 8.5" x 11" for printing, sharing and display. Teach by example and show the world. We know you make great choices about using pet safe ice melters and traction aids ... now help us educate others by displaying your choice. If your neighbour sees your positive choice, maybe they'll choose differently too. Group dynamics is strong -- let's use this power for positive change! ​View / Download / Print Large PDF poster, 8.5" x 11"
View / Download / Print Small PDF poster, 8.5" x 5.5"
If you absolutely want to use an ice melter, these commercial brands are listed as "safer and/or less harmful" ice melters according to the manufacturers, and it's important to not use too much and follow directions as labelled. Most websites have a "Store Directory" on their websites for ease of finding. Happy Paws Ice Melt - website states made with calcium magnesium acetate (CMA) and contains no salts, chlorides, urea or glycols. Morton Safe-T-Pet Pet Care Ice Melt - website states made with urea, and salt and chloride-free. Mountain Organic Natural Ice Melter - website states made with "potassium chloride and other ingredients" and states it is "non-toxic and not dangerous to children and pets" although their online Safety Data Sheet states can be irritating to skin by doesn't state quantity of product needed to cause irritation, and could be an unusually large amount beyond the regular use in the environment. Paw Thaw by Pestell - made with calcium magnesium acetate CMA) and "less harmful to your pet’s paws than other commercial ice melters". 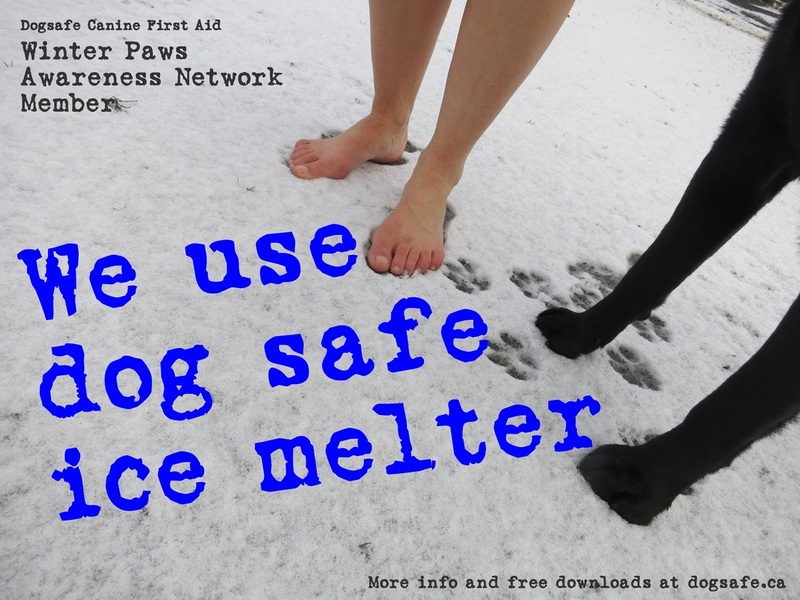 ​Safe Paw Ice Melter - website states made with "amide/glycol admixture and does not contain corrosive salts, chemicals, or dyes". This was the only product that displayed an independent Toxicological Risk Assessment (TRA) report on their website which stated that "the “Ice/Snow melter” is not anticipated to cause acute toxicity of any significance among the general consumer population, when used as intended, and can be considered as “Reasonably Safe” for its intended use. However, the following precautions must be adopted; Avoid generating dust. Wash hands after use. Avoid contact with eyes and skin. Keep away from children. " ​* Dogsafe does not have any relationship with these brands and they are listed for information purposes only. Sand, gravel, wood chips and natural kitty litter (non-clumping) or the listed commercial products can all be used to provide traction on winter conditions. Check garden supply or hardware stores for sand, gravel and wood chips. Check pet stores for natural kitty litter. Check the company websites for a "Store Directory". EcoTraction - website states made with "hydrothermal natural volcanic mineral and is safe to touch or accidentally ingest by children, pets and wildlife".